“You dig a big yam up with a stick made out of yuka, it has to be a big one,” explains Abia Bai, a community elder from the Maiyawa tribe, who is sharing with me the secret to a good yam harvest. Find out more about the people of the TransFly, a vast savanna region in Papua that WWF is trying to protect. 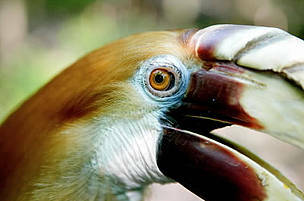 Blyth's hornbill is one of many bird species found within the TransFly.